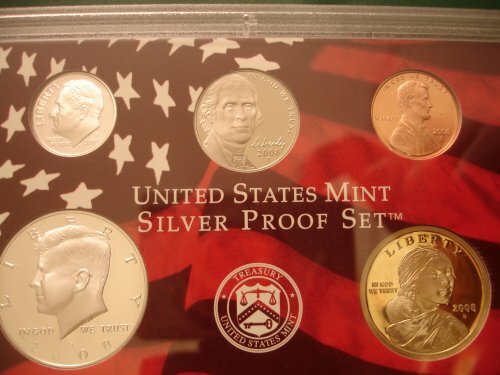 Proof Sets are coins struck by the mint which have specially treated and polished dyes and which are most often struck with special care, at slower rates and more pressure to create an idealized version of the coin. 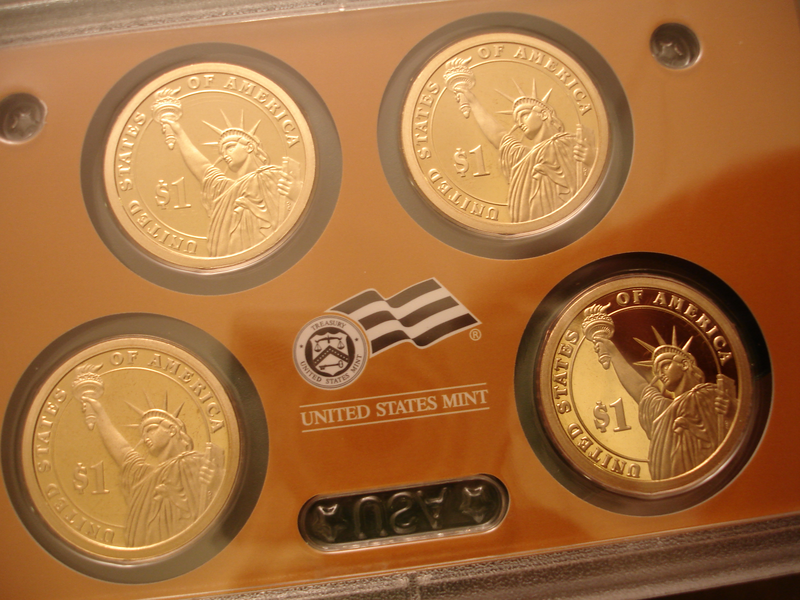 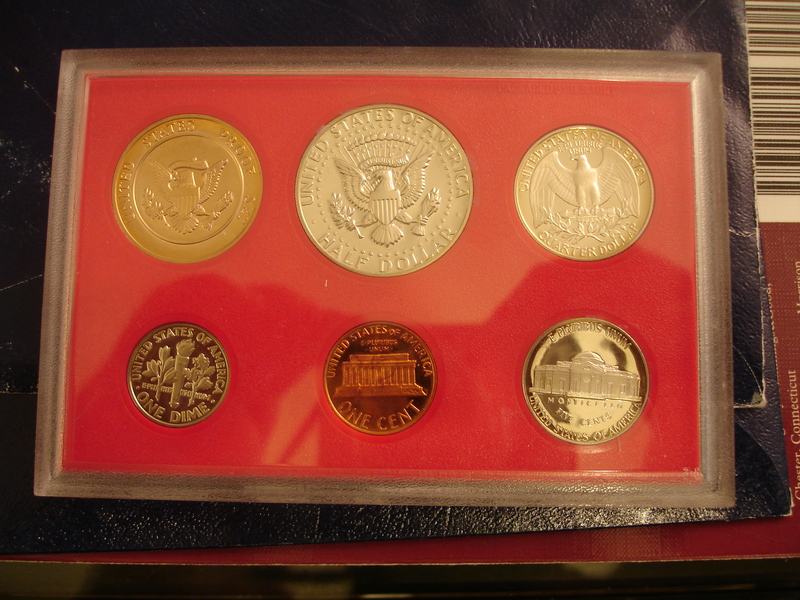 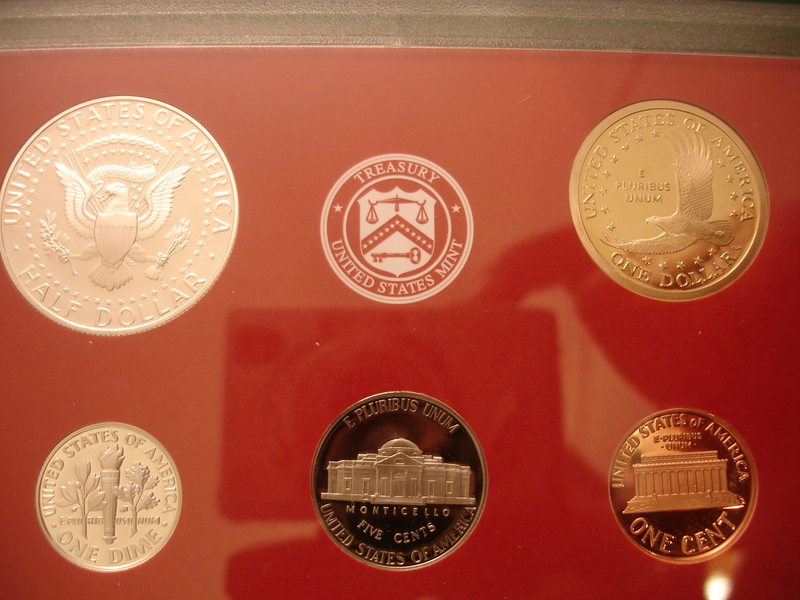 Proof Sets are a common way which people are introduced into coin collecting. 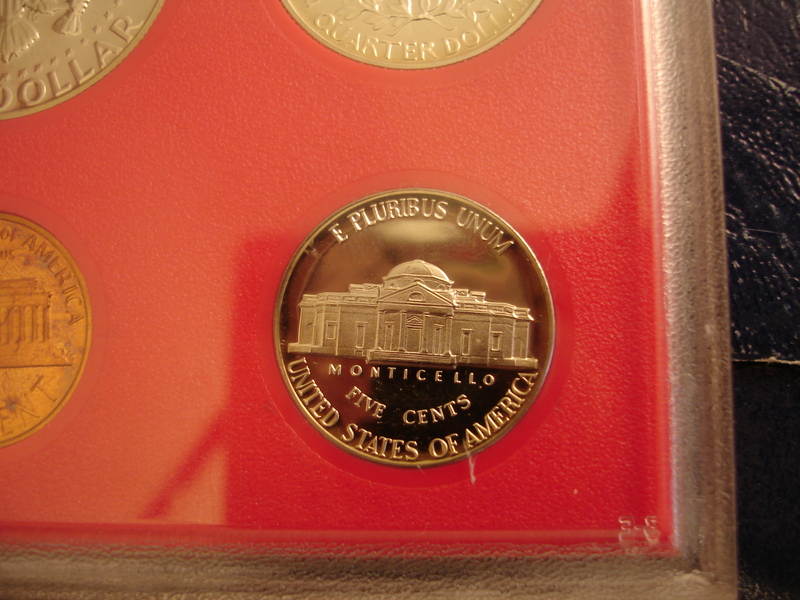 They are not created for general circulation, although many proof sets are cracked open by collectors fishing for top level proofs which they send away to the various certication and grading companies to be graded and slabbed. 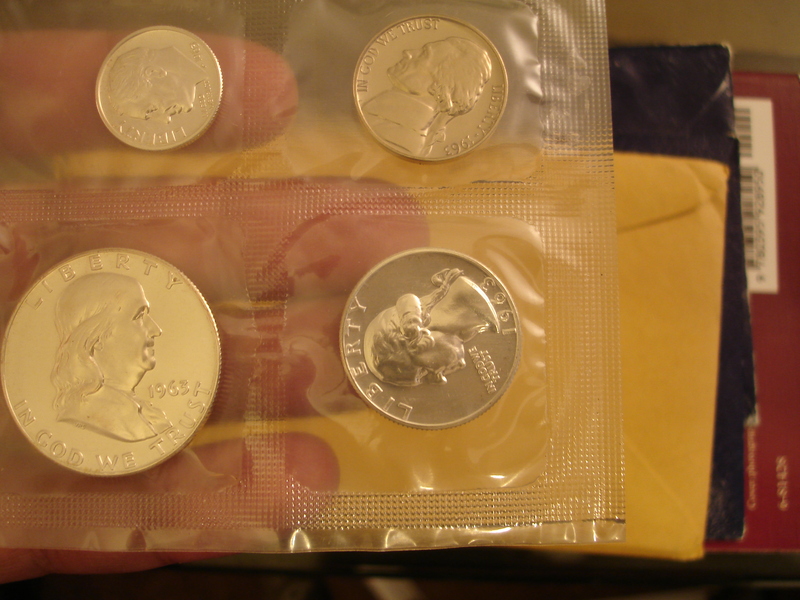 Those that don't make the mustard are then basically dumped into circulation. 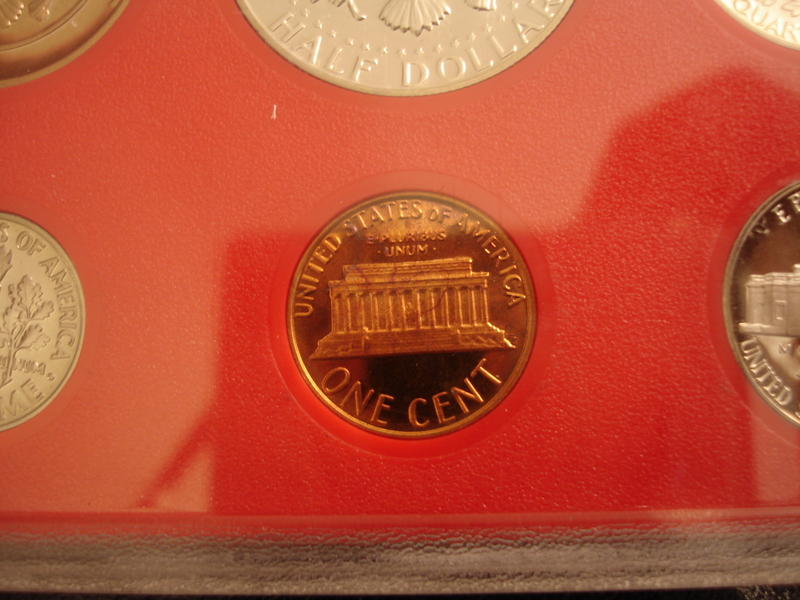 So it is possible to aquire a proof coin, from time to time, in circulation. 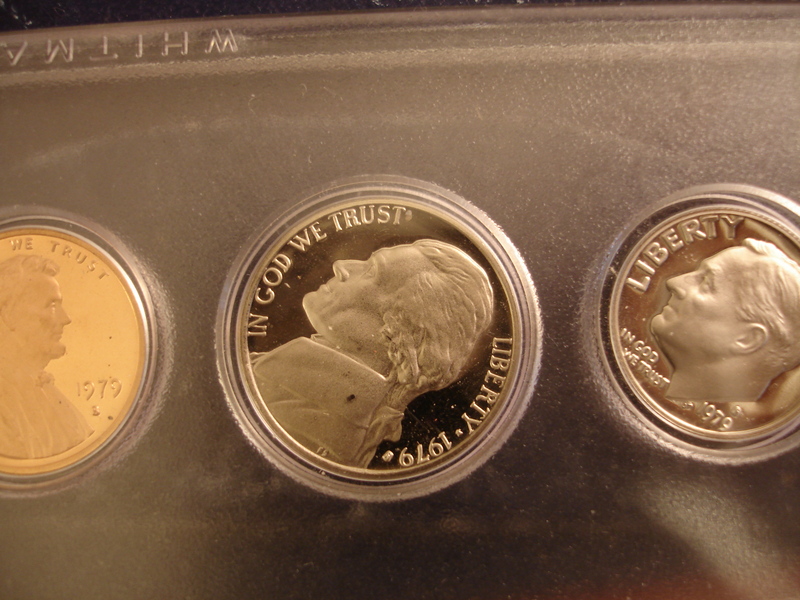 Some Proofs are hard to spot for a beginner collector. 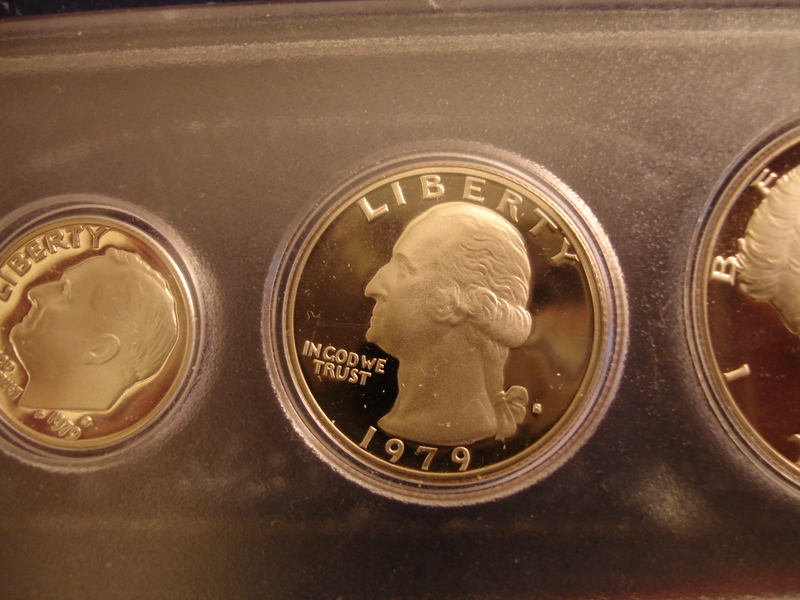 For example, Franklin Halves, especially in the years where the dyes were weak in detail, are hard to seperate proofs from brilent uncirculated coins due to the lack of detail on the coin with Franklin's jovial round cheeks and balding head. 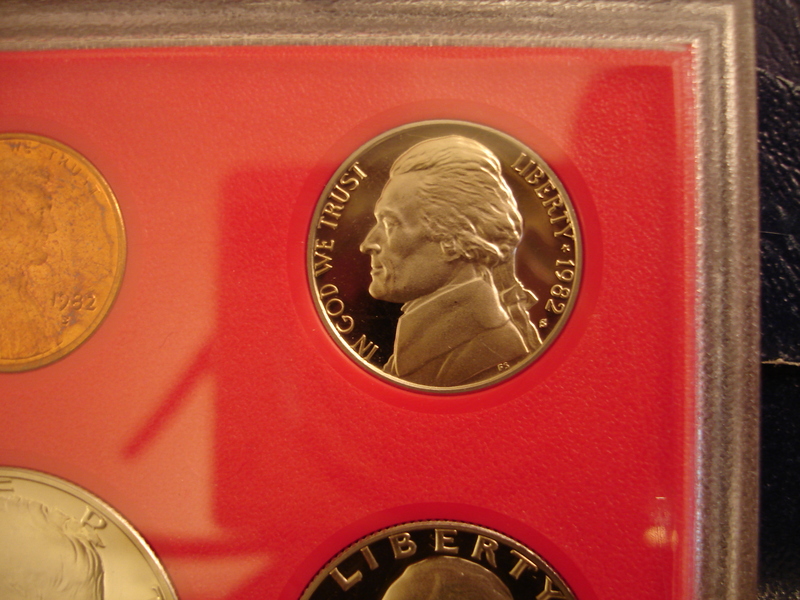 On older coins, the difference between great business strikes and proofs can be disputed even by experts. 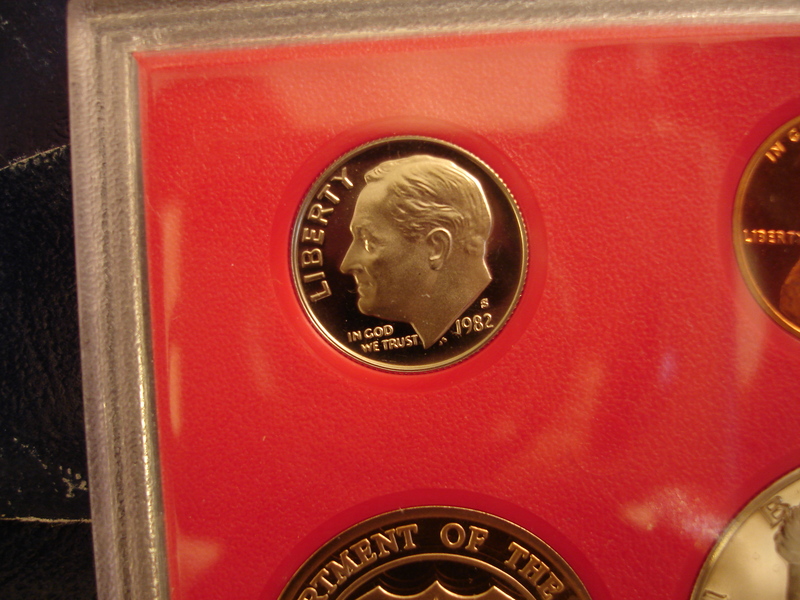 Sometimes there is a question whether any proofs have ever been struck for that coin and year. While the US Mint had created Proof Sets and Proof coins from time to time for a variety of reasons, US Proof Sets didn't become a regular product line for the Mint until in the the middle of the 20th Century starting in 1936. 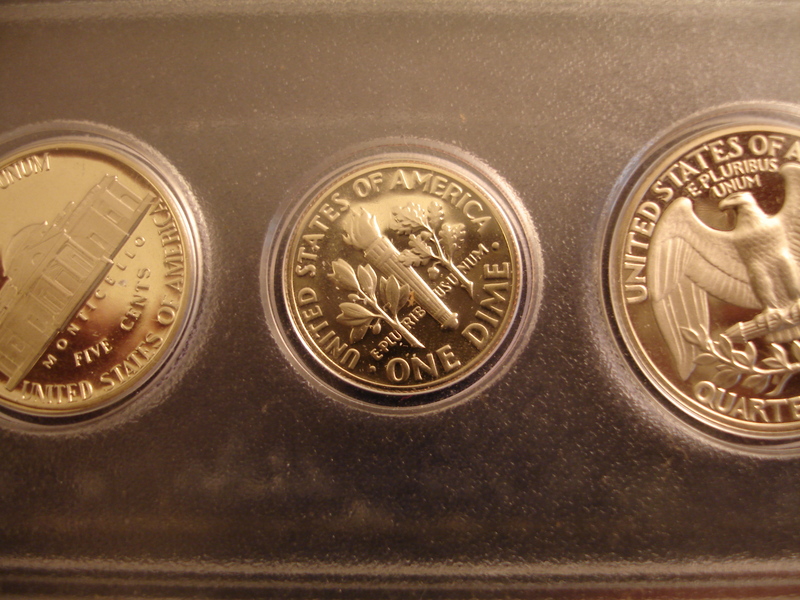 Production stopped between 1942 and 1949 and then picked up again by the mint in the post war boom from 1950 on until the present although in 1983 only a "Prestige" set which inlcuded a Los Angeles XXIII Olympiad Dollar. 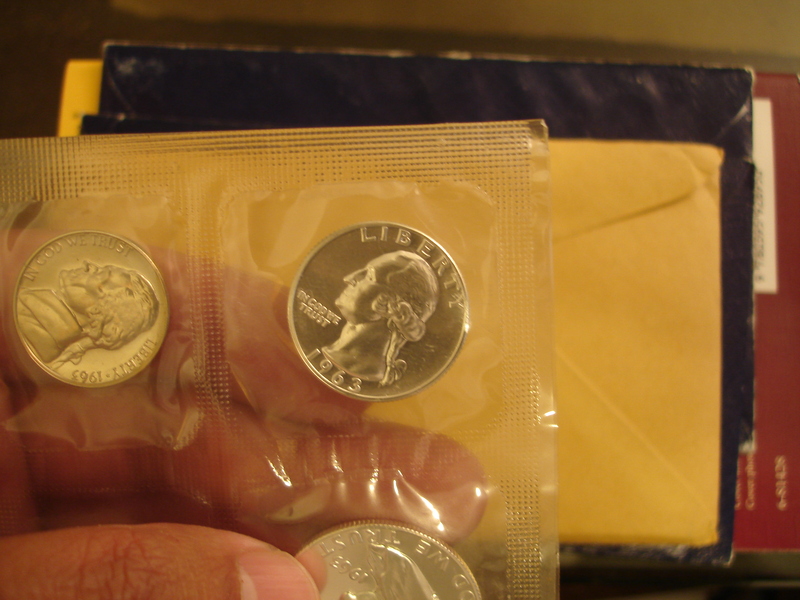 At least from 1955 proof sets were sold in a clear flat plastic wrapper to protect the coins. 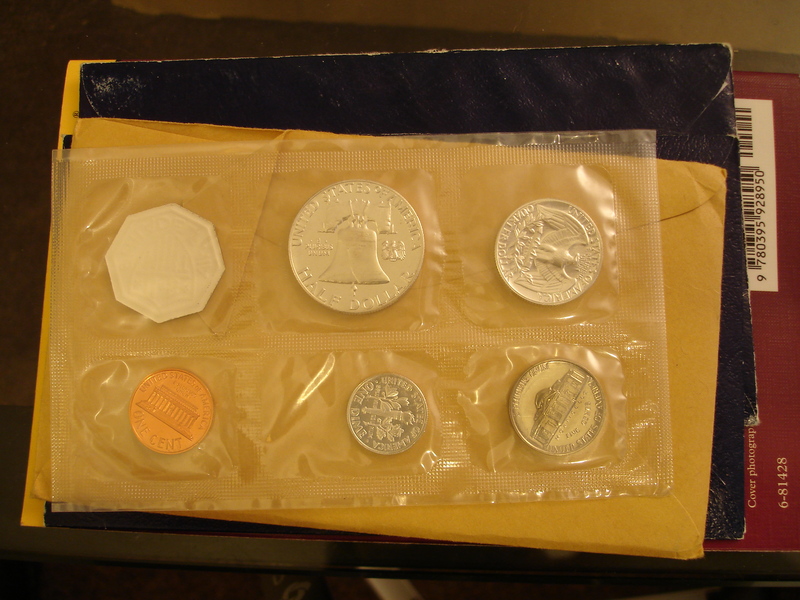 However the wrapper as can be seen here make photographing the sets a real challenge without studio equipment. 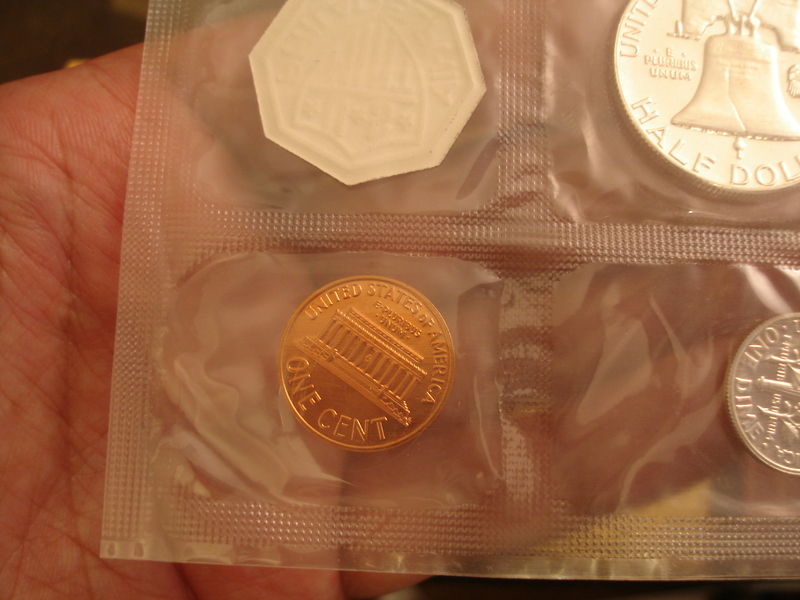 Many of the photographs of our proof are taken with this wrapper so I apologize in advance for the lack of clarity of some of these photographs. 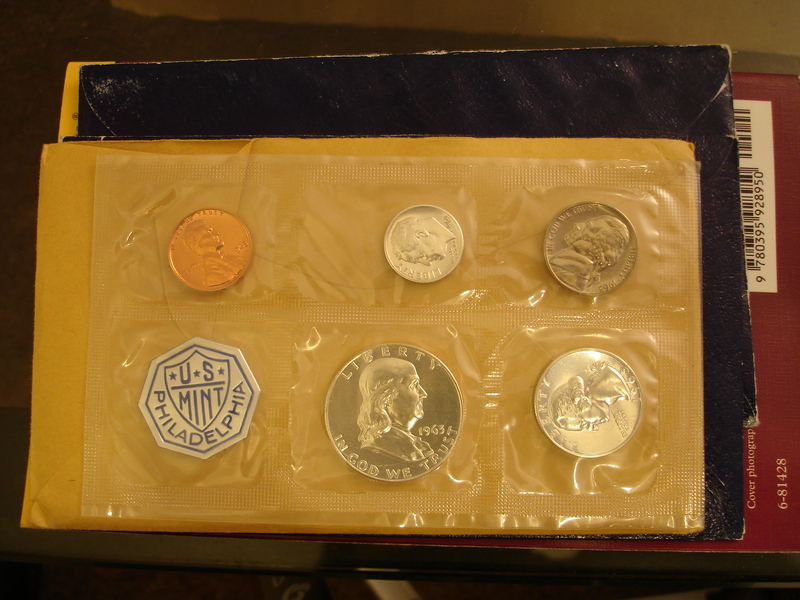 In the 1980's the mint started to produce these coins in hard plastic cases which made them much more viewable and photogenic. 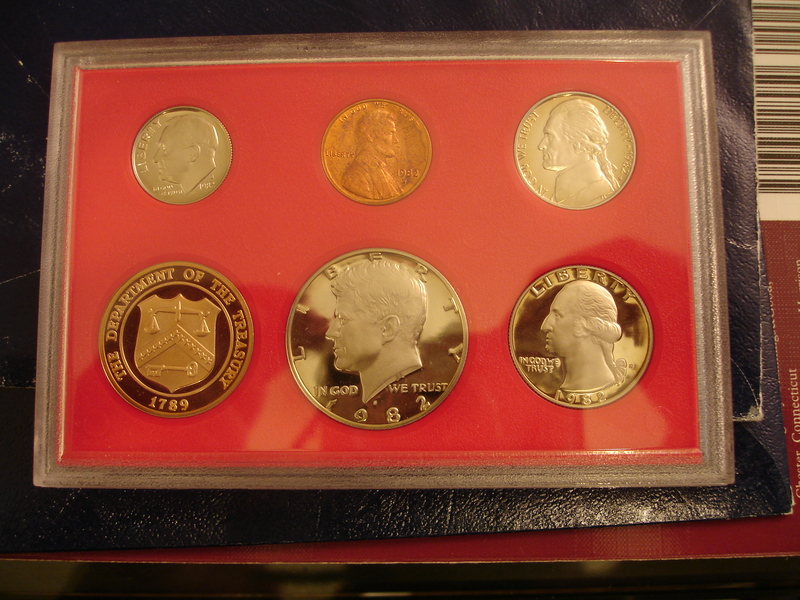 Obverse of one of several 1963 Proof Sets that we own. 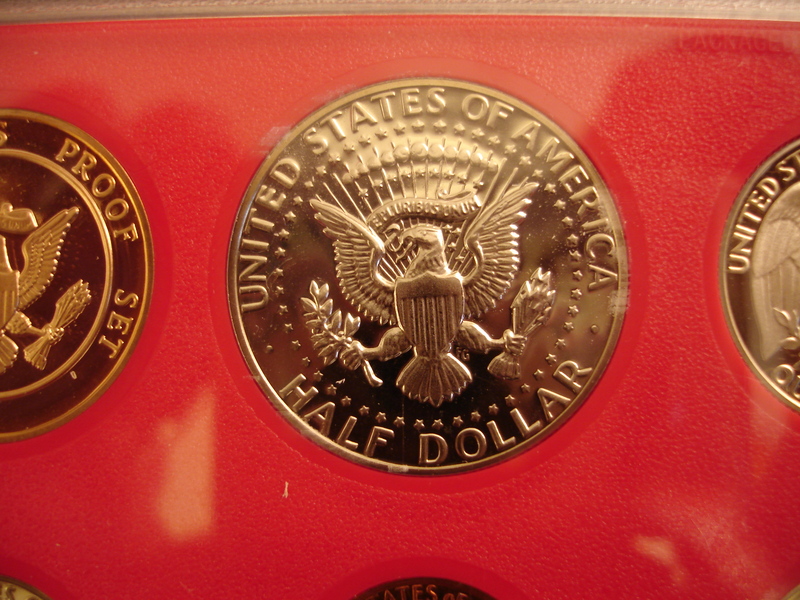 Franklin Half Dollar. 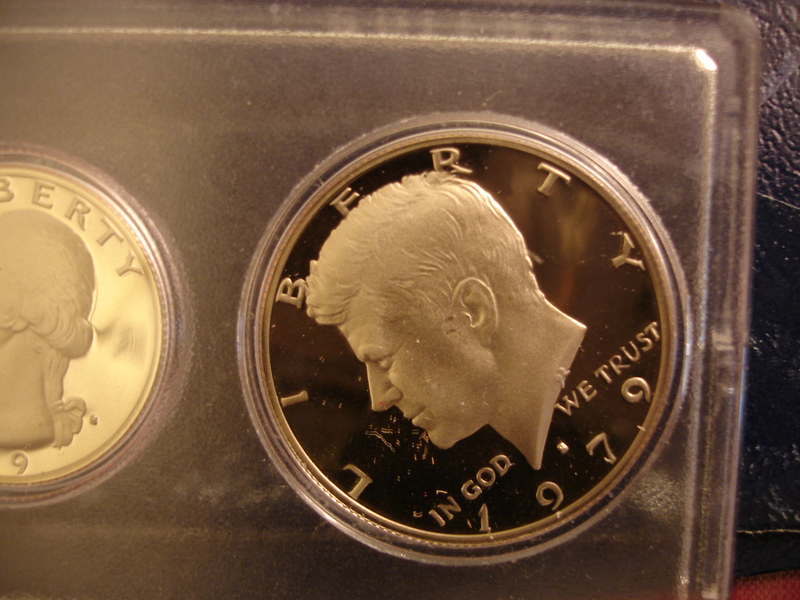 The assasination of JFK leads to a change of the half dollar in 1964.
my birth. 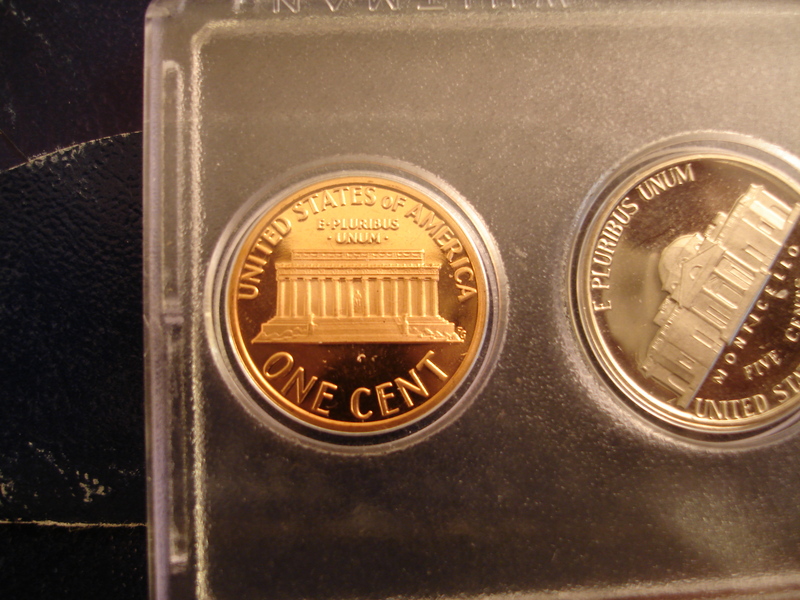 This might not be the best of them but it is the one which photographed the best. 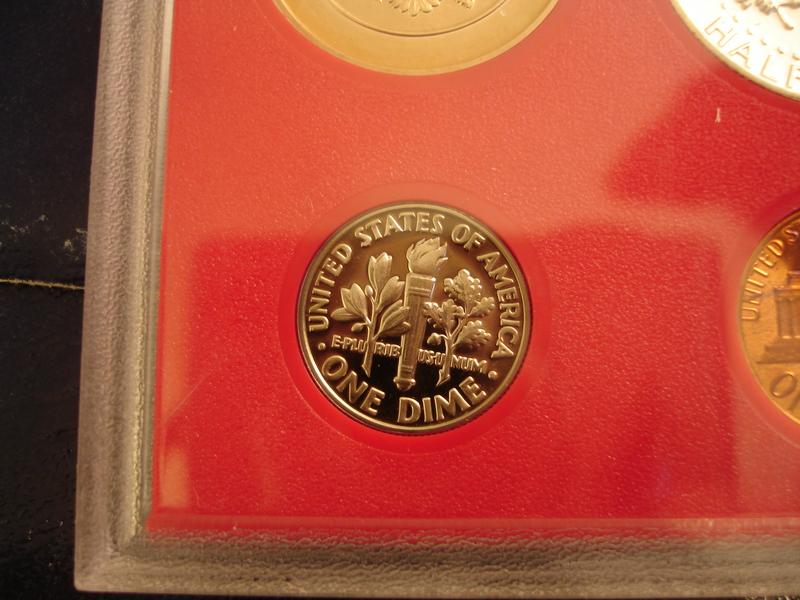 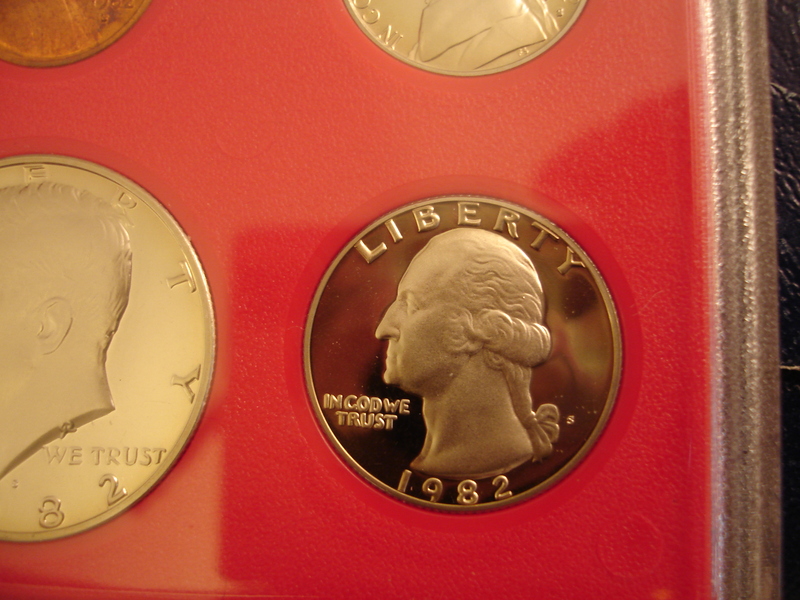 This this the obverse of the second 1963 proof set which was had close ups of the dime, nickel, quarter and half above. 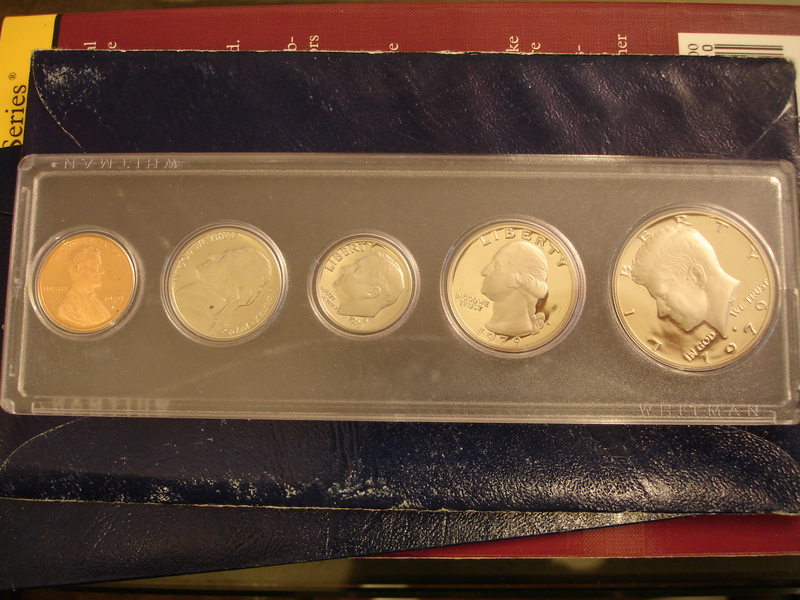 The 1982 Proof Set below is in a hard plastic case. 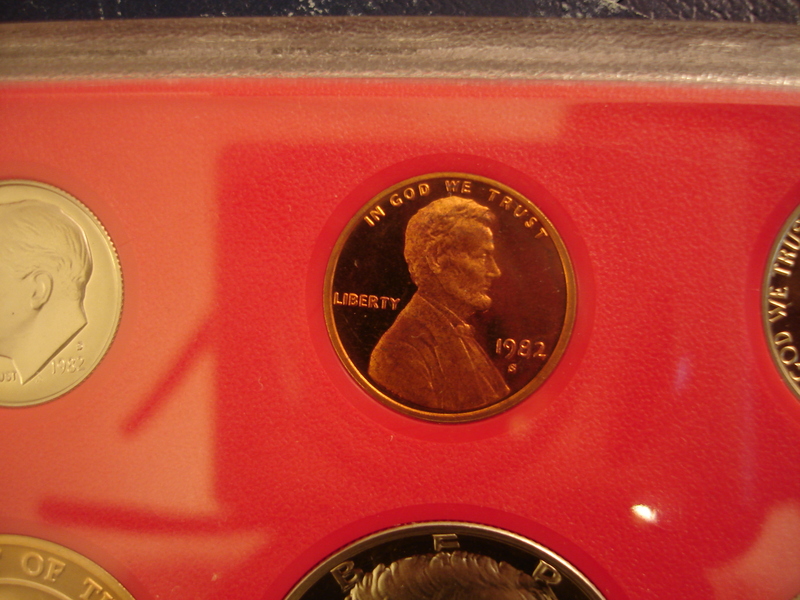 The resuting photgraphy is much cleaner and perhaps some of the coins are nicers as well. 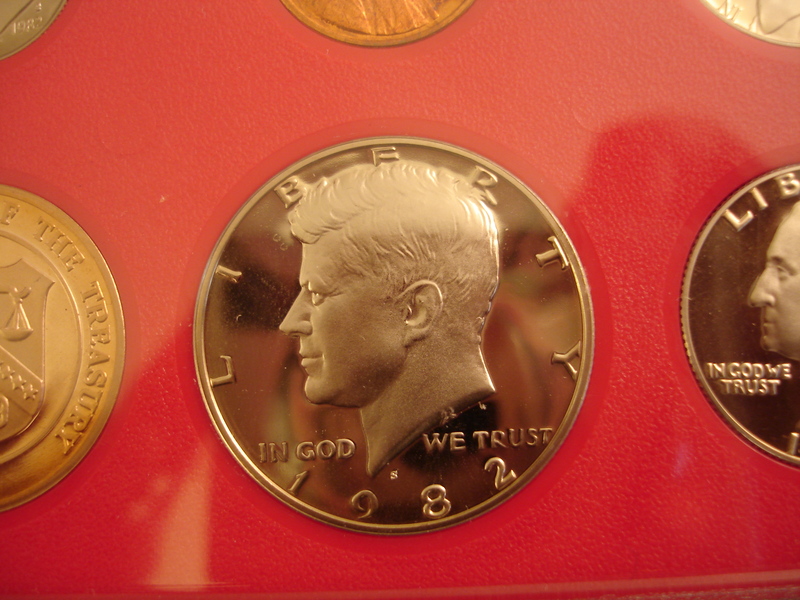 Particulary nice is the obverse of the Kenedy Half dollar which has exquisite detail and satin finish on the facets. 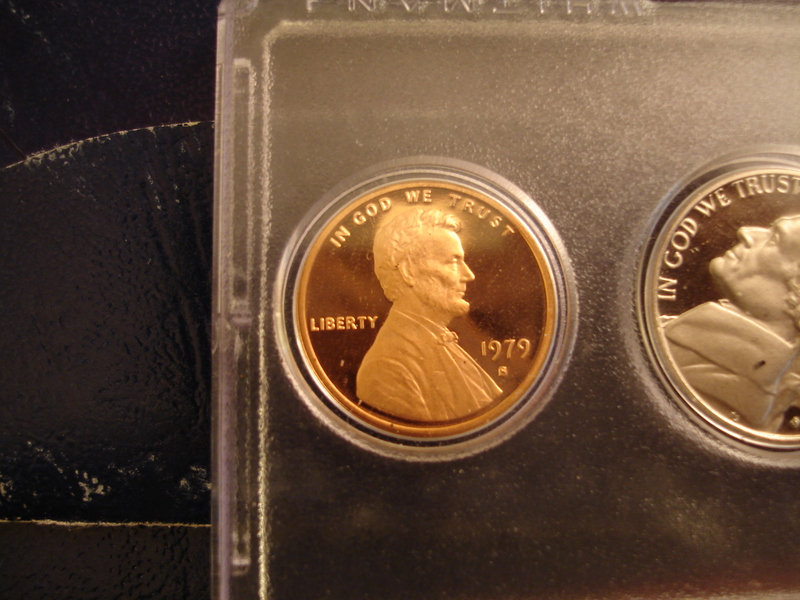 We also have a 1979 Proof Set which is was a throw in from fastcoins. 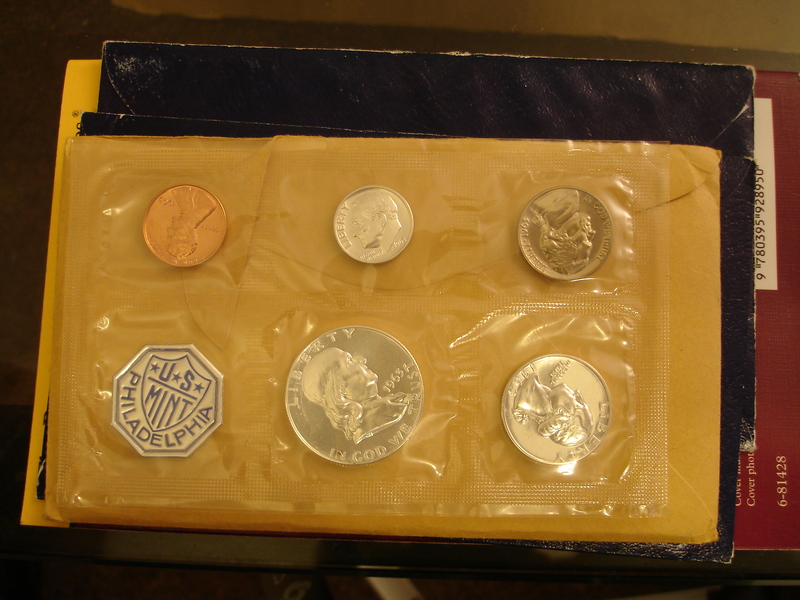 Not an official set, this collection is in a commonly available hard plastic holder and was put together by someone, possibly left over coins from someone trying to find deep cameo proofs for grading. 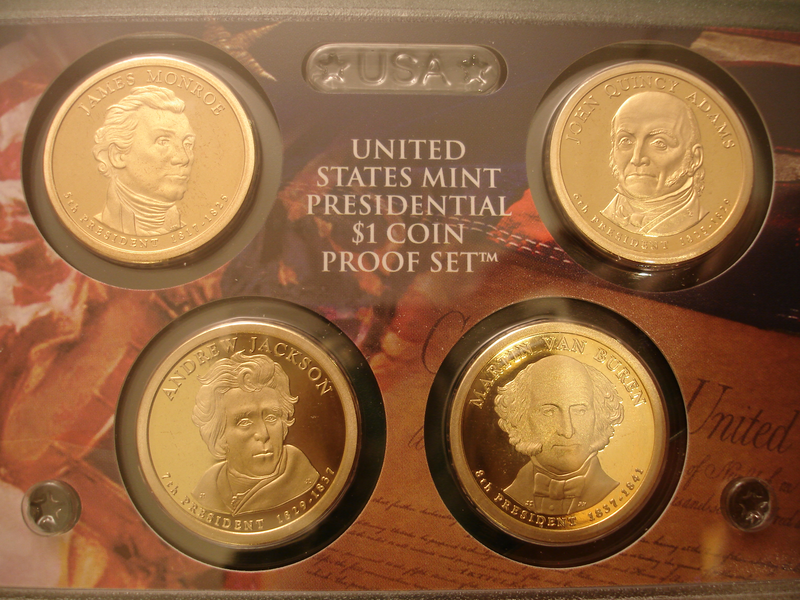 Over all it is a nice set. 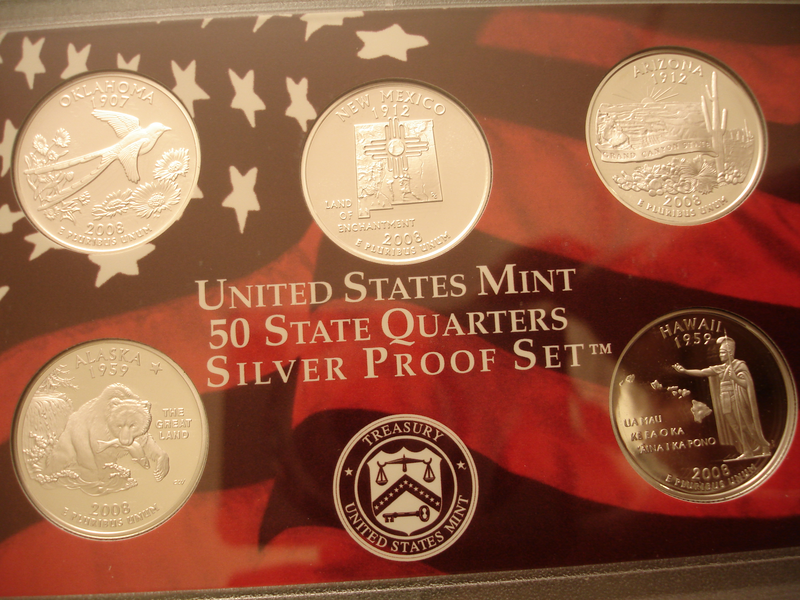 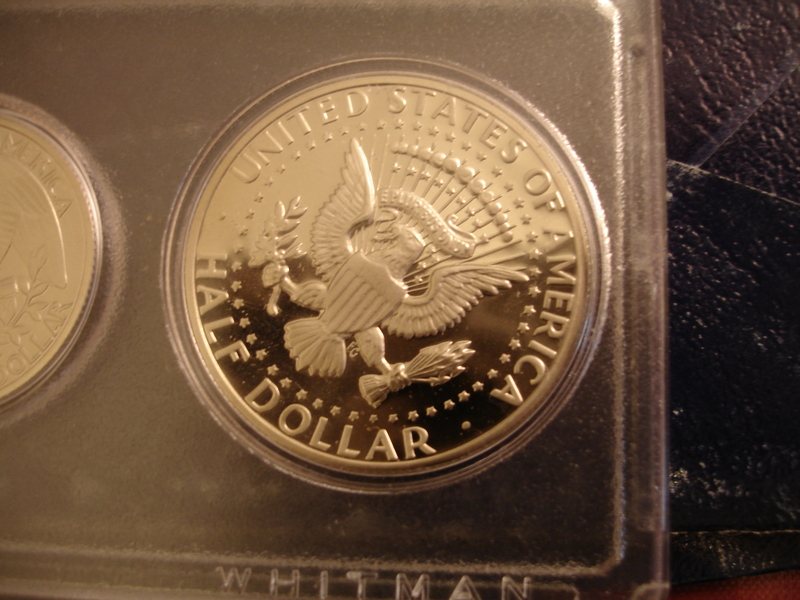 We buy current Silver Proof Sets from the Mint. 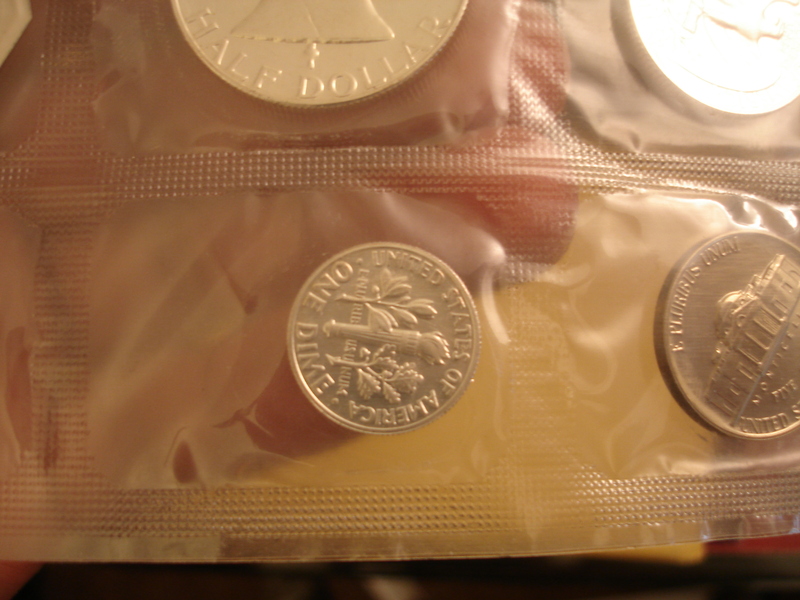 Here is the 2008 with the silver State Quarters, and the Presidential Dollars. 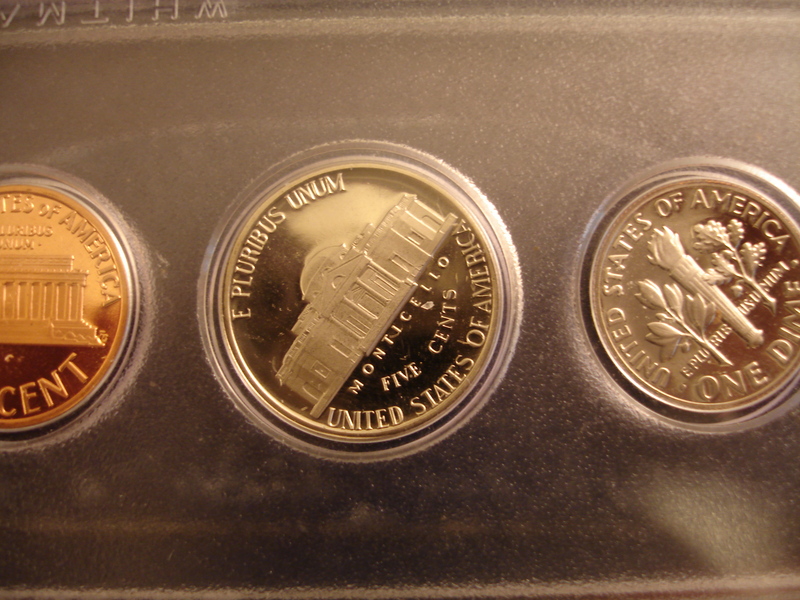 All the Modern sets are San Fransico productions. 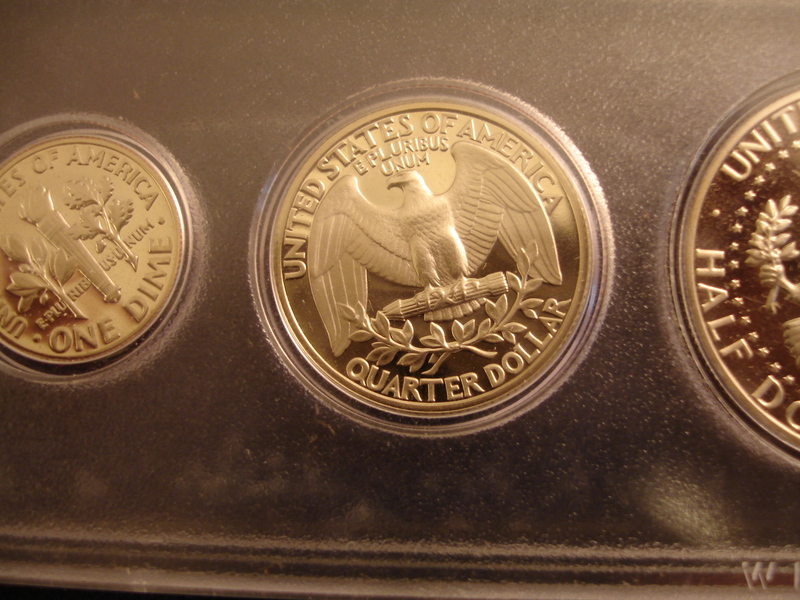 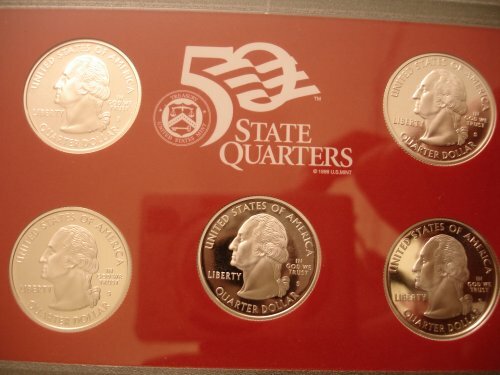 The Quarters are Oaklahoma, New Mexico (which is a very nice design), Arizona, Alaska and Hawiai. 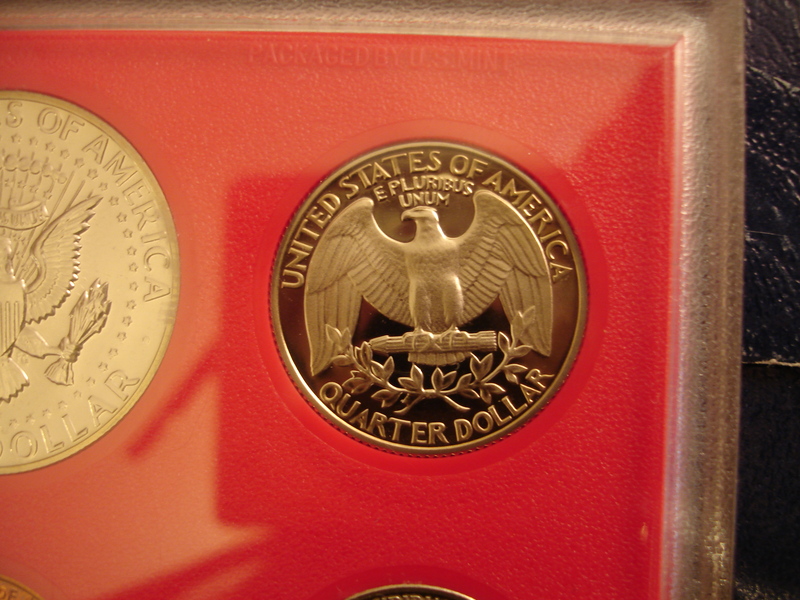 The Alaskan bear is nice and is the first Bear on a US Coin.